As our regular readers know, we live near Augusta, which is famous for being "the home of the Masters". Life here revolves about the golf tournament. Schools are closed, and many residents leave town so that they can rent their houses to corporate bigshots who come to watch "the tradition unlike any other". The tournament is a huge boost to the local economy, especially for hotels, restaurants and golf courses. The boss at work generously shared a ticket to the Monday practice round with a few of us employees. I got the afternoon slot from 3 to 6 pm. Lisa was kind enough to drive me so that I didn't have to worry about parking. It was my first time ever at Augusta National so I was really looking forward to it. The weather had been a bit cold in the morning, but it was nice, even unexpectedly sunny, later in the afternoon. My first impression was: Wow, there are a lot of people here! But after not too long I realized that the event was very well organized. The grounds and golf course were absolutely beautiful. I guess that's what everyone says, but it's true. 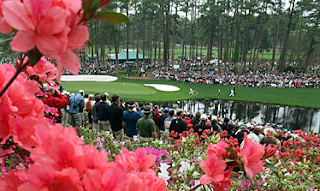 The Augusta National people want to put on the best golf tournament in the world. They're not worried about maximizing revenue so you don't see a lot of advertising and corporate sponsorships. Prices are reasonable: a beer is only $2. The face value of the practice round ticket is $36. Of course, you have to win a lottery to get a chance to buy practice round tickets. They might be worth ten times that on the street. The actual tournament has been sold out for many years so there's no way to get a ticket unless you know somebody with connections. Walk-ins enter from Gate 3-A on Washington Road. Players and members have their own entrance so they don't have to queue with the plebs. I arrived fairly late in the day so I imagine that most of the people had seen enough of the players and were looking for souvenirs. The "Patrons Corridor" near the entrance was packed with people overflowing from the Golf Shop. I made my way slowly through the crowds and headed out to the Amen Corner (holes 11 through 13), which are known as some of the most dramatic in golf. I then wandered around the course just to get a feel for the place. Every once I stopped to watch a few golfers play through. Tiger Woods had played early so I didn't get to see my personal favorite. As many of you know, Tiger and I both went to Stanford. I wore my Tiger hat (courtesy of Buick). That's pretty much where the similarity ends. I did get to see a few notables such as Ernie Els, Vijay Singh, Mike Weir and Geoff Ogilvy. During the practice rounds, the players often hit an extra ball or two just to try things out. They spend a lot of time around the green getting a feel for breaks. It's amazing watching them attempt some of those long puts that follow a horse-shoe path right to the cup. Towards the end of the day, I camped out at the 18th green ("Holly") as Ernie Els and Retief Goosen were teeing off. I remember thinking to myself that I was standing right next to the green -- I certainly wouldn't risk that if I were playing. A few minutes later, Goosen hit his approach shot into the crowd about ten feet away from me. Fortunately, there were no injuries. Goosen checked that the guy was OK and told him to keep the ball as a souvenir. I also walked around the club house and practice range. Some areas were roped off to the crowds, but it was fun to see everything even if I couldn't enjoy a cocktail with the members. It was a great afternoon. I'm very happy I had a chance to go.